The second practice session confirmed that there is very little to choose between the Ferraris and McLarens at the Nurburgring circuit. This time Raikkonen was quickest although, like most of the drivers, he was a little slower than he had been in the first session. Hamilton was next up, followed by Massa and Alonso, the front four within three tenths of each other. This looks like being a tough battle for pole and the win. The Toyotas remained quick, Ralf taking fifth spot and Trulli in sixth. BMW were trying hard in this, their home GP, but were pipped for the next fastest by Rosberg's Williams and, surprisingly, Button in the quicker of the two Hondas. Button's time was marginally faster than in the first session and, although I hesitate to talk about revival in Honda's fortunes, the signs are hopeful for the long-suffering Englishman at last. Once again Nick Heidfeld managed to put in a quicker lap than Kubica, the two BMWs ending up ninth and tenth fastest. Qualifying should see them move closer to the front, however. Renault too should be faster tomorrow when it really counts, their 15th (Fisichella) and 16th (Kovalainen) spots not really representative of the team that has been the main challenge to the BMWs in the last few races. Mark Webber upheld the honor of the Adrian Newey design by putting in the 11th fastest time but his team mate and the Toro Rosso boys were well down the order. It really is time that the Red Bull teams began to make more of an impact and put their early problems behind them. The rest were more or less where you'd expect them. 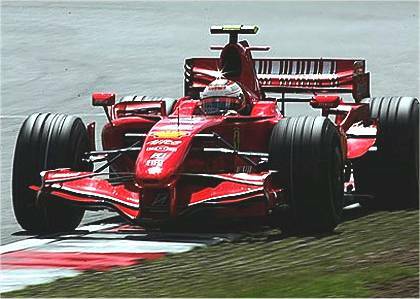 We should remember that competition is so fierce these days that, ignoring the Spykers, little more than two seconds separated the quickest car from the slowest. That midfield battle is as close as we've seen in many years and, to some extent, it's a lottery as to who comes out ahead.